‘A piece for an environment’, is a performance that incorporates the environmental sounds of the place where it is performed. Six microphones are spread over the place and pick up the sounds of traffic, passers-by, nature or industrial activities. Those sounds are electronically processed (in Pure Data), and the processed sounds are distributed over six speakers placed around the audience. 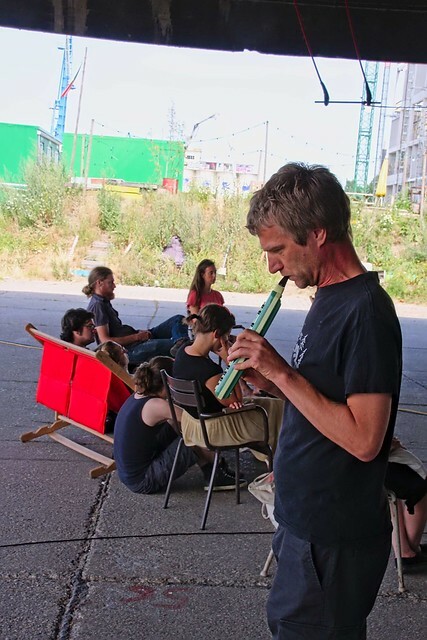 The musicians move around in the space while playing, and also their sounds are processed in different ways, dependent on the place where they are playing. ambient music, chamber music, environmental music, pure data. Bookmark.